The 32 Inch Canvas Show opened in Toronto on Friday November 19th at Goodfoot in Toronto. The show has been traveling across Canada featuring the work of over 65 artists from Canada, the US and Europe. After Toronto, the show will travel to Montreal on an undisclosed date. 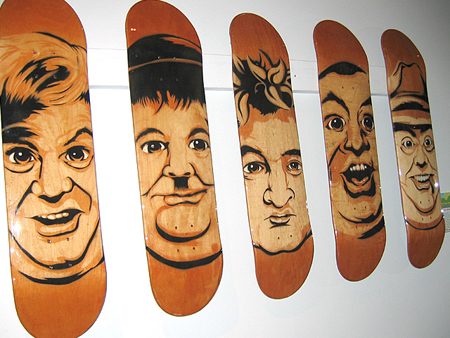 Artists were selected based on their exceptional work as well as their influence in the skate community. 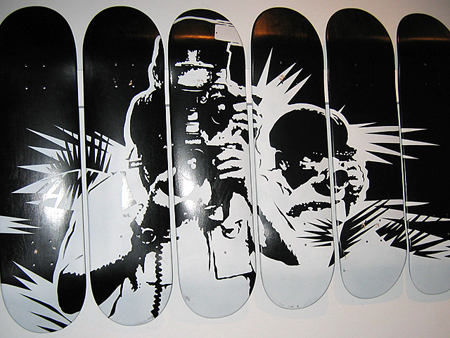 Each artist was sent a blank deck and a wide open creative brief. Artists include Andy Howell, Geoff McFetridge, HVW8, Sam Flores, Stash, Derrick Hodgson, Chris Wellard and AmoebaCorp’s own Mikey Richardson. Due to space limitations, not all of the work was shown – I didn’t see McFetridge’s work, for example, or the work of Jeff Soto and Jordan Isip who are listed on the official website list of artists. Oh well. The show is quite a good one, and I’d recommend checking it out. The guys at Goodfoot did a really good job of presenting the decks, they’ve got a real knack for presentation. Now that the show opening is over, the store has some of it’s footwear back on the shelves, so you can now shop for shoes and art at the same time. maybe shell out for a deck with a matching pair of kicks.